The EZDIVE KF – SZ Inner Blade Design Scuba Diving Knife is a high quality knife designed for use by deep explorers who explore reefs, caves and wrecks. Its unique dual-side design makes it effective and safe. It is available with 2 additional pieces of replacement blades. The design inspires high level of diving experience and peak safety. The EZDIVE KF – SZ Inner Blade Design Scuba Diving Knife has a high-grade, sharp cutting system that offers efficient and faster cut. It is ergonomically designed for ease of use. The line is pushed by the frame onto the blade. The pressure of the cut is distributed across the length of the blade, thus helping retain the integrity of the blade. The compact size of the gear makes it perfect for use in diving conditions. The dual-side design also makes it highly versatile for applications in different situations. The knife’s frame is made from high-strength plastic that provides protection to the blade edge. It can be used to cut lines of width up to 8 mm. You can easily remove the blade for cleaning or replacement. Carry it along safely in the pouch. Besides, there is no need to worry about the cutter from getting accidently deployed. 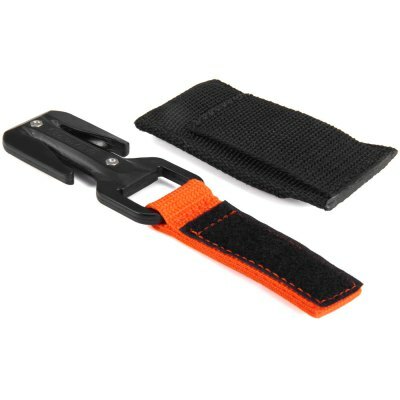 If you are a diver, mountaineer, mariner, rescue service provider, or an extreme sports adventurer, make sure to have your set of Scuba Diving Knife. It will help you complete your tasks with more efficiency, more safely and more swiftly. It is designed for durability and longevity, and will be beside you every time you are in need. Most importantly, the diving knife is extremely safe.